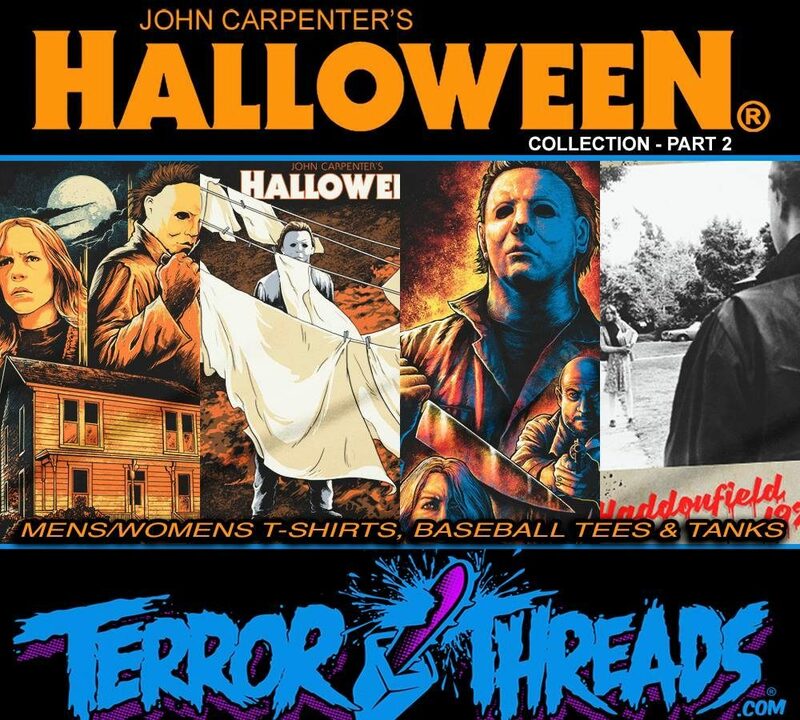 Our friends over at Terror Threads have will release Part 2 of their new officially licensed Halloween collection, featuring Michael Myers, Laurie Strode, and Dr. Sam Loomis in four more new exclusive designs inspired by John Carpenter’s 1978 classic. Part 1 of the collection was released last month, consisting of four designs, including one that is printed with black light reactive inks. Available in men’s and women’s t-shirts and baseball-style tees, these new shirts are all made from 100% super soft combed ringspun cotton, professionally screen printed and proudly made in the USA, any of which you can purchase through the links below. The second half of Terror Threads’ Halloween collection (previewed below) will be released this Friday, March 24. Along with this Friday’s release of standard t-shirts and baseball tees, Terror Threads will also be adding tank tops available in all eight Halloween designs. Click on one of the images below to purchase any of the t-shirts or baseball tees from Part 1 today, or click here to shop the full Halloween collection!